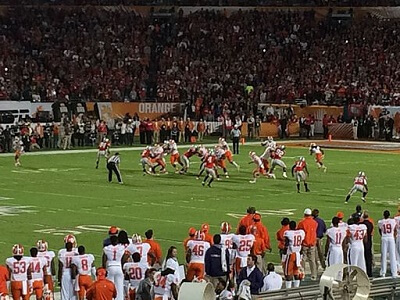 Get notified when Orange Bowl tickets are available! Every year, two top college football teams face off at the Orange Bowl, an annual event sponsored by the NCAA. Founded in 1935, the game is one of the oldest of the bowl games that is still played today. Normally, the Atlantic Coast Conference hosts the game with a top team playing against a team from another NCAA conference. Nearly every year, the Orange Bowl is held on January 1, New Year’s Day, and the location is typically New Miami Stadium, which is located in Miami Gardens, Florida. You can be there for the next Orange Bowl by buying Orange Bowl tickets online.